• If you do not have any of the above, you can set up a Google ID here. Note — You will need your Google ID prior to purchasing this course as the checkout process requires you to enter your Gmail address or email address associated with your Google account. If not having a google ID is a hindrance to purchasing the course please contact us and we will assist you. 2. An internet connection with enough bandwidth to enable you to watch streaming video or download audio. • We recommend a minimum Internet connection speed of 500kbps to be able to watch the videos with good resolution and minimal buffering. 4. You DO NOT need to install Google drive on your system. All you do is enter the id and all of the content is available to you. Enter a full email address. For example, if your email address is [email protected], enter the full address including “@domain.com”. If the email address does not go in properly at this step the course will not open. Once you receive your email confirming your order, go to elearning.vantharp.com and log in with the google id you provided on check out. After considering a lot of video hosting options we determined that Google via Google Drive provides an effective and efficient way to host the significant amount of course content, however, a google id is a requirement to access google drive. If you need assistance with this, please contact us before making your purchase. The lectures are all provided as video recordings from the live workshop. You need a fast enough connection to be able to watch video without frequent interruptions and enough resolution to be able to interpret what you see. A dial-up account will not allow you to watch the videos effectively if at all. Even if you have “broadband” service, you may experience buffering (interruptions in the video playback) or a lower resolution of the video (fuzzy image), just as you would if streaming a video service like Netflix without enough bandwidth. 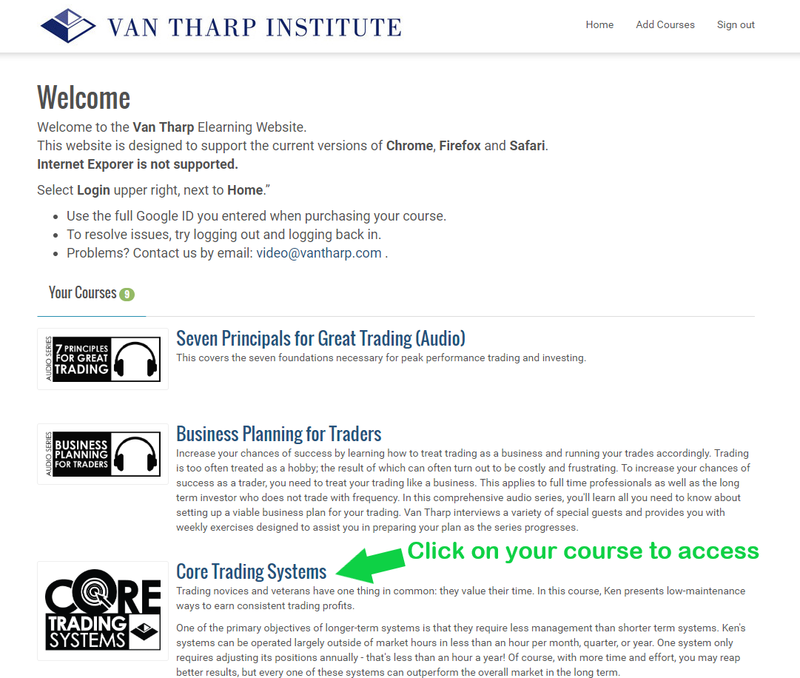 I do not see any courses listed under “My Courses” at elearning.vantharp.com, even after I log in with my Google ID. If you are having this problem, there are a few things to check. Make sure you are logged in with the Google ID that you provided when you purchased the course. Refer to your email receipt to see what you entered as your Google ID on the checkout page. If you have multiple Google IDs, you may have been already logged into a different one when you accessed the eLearning page. If this is the case, click the “Sign Out” button in the upper right-hand corner of the page, and then sign in again with the correct Google ID. If you notice on your email receipt that you accidentally misspelled your Google ID (please note: our system is case-sensitive), or did not include your full email address (left out @gmail.com, for example), please contact us by email or phone, 919-466-0043, and we will manually add you to the course with the correct ID.